The tiny-house movement has been percolating in North America for two decades, as people have looked for ways to reduce the cost of housing and live a simpler life. It’s getting a big push in Metro Vancouver this year, as two local women have ramped up a campaign to promote the idea of living in small, portable houses of less than 500 square feet, as well as to get buy-in from local municipalities. “It’s a model for affordable home ownership. 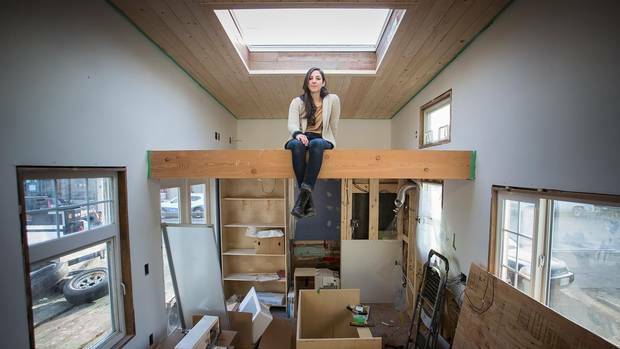 And the ecological sustainability is one of the principles behind it,” said Samantha Gambling, a 28-year-old housing and food-systems consultant who is having a 220-square-foot tiny house – 10 by 22 feet, with a loft – built for her in a construction yard in North Vancouver. She plans to move it eventually to land near Main and 41st in the City of Vancouver, on land owned by a developer willing to let her stay there while he waits for permits. “We want to use my house as a model there to see what do the neighbours say,” Ms. Gambling said. But unlike others in B.C. who have built tiny houses and tried to avoid the notice of city officials when parking them, Ms. Gambling and her 36-year-old collaborator, Anastasia Koutalianos, have been throwing themselves into an effort to make city officials aware of the tiny-house movement and willing to consider bylaw or zoning changes that could make them legal. They’ve formed an organization called B.C. Tiny House Collective to promote research into this option, including their own survey to test public awareness and interest. They have approached both Vancouver and Maple Ridge planners with requests to talk about these houses as a potential housing solution. And they’ve organized information meetings in the past and are conducting a one-day feasibility session Jan. 24, with representatives from a number of municipalities. The two emphasize the concept is meant to be just one choice among many when it comes to housing options for this stressed region. “Tiny houses are not for everyone,” said Ms. Koutalianos. They are undoubtedly small spaces and people have to be willing to live with less. But they can be built much more cheaply than laneway houses, which are usually bigger. Ms. Gambling’s house will cost between $60,000 and $80,000 when it is finished, she said. A typical laneway house in Vancouver costs $250,000 to $350,000. Many people who advocate for tiny houses are motivated less by the savings than by the idea of living in a more minimalist, sustainable way. They’re not moving into them as a way of coping with an out-of-control real estate market, say the two women. Tiny-house proponents often aim to use recycled materials for their houses, which makes them more environmentally friendly. Tiny house have become choices in various parts of North America, sometimes located in clusters on community-owned land, to provide housing for the homeless, for youth camps, for people in resource towns where there are housing shortages, and for women over 50, a growing demographic of people living alone. The tiny-house (under 500 square feet) and small-house (under 1,000 square feet) movements have been growing since about the mid-1990s, in part spurred by the publication of the book The Not So Big House by Sarah Susanka. Portland, Ore., has permitted tiny houses in a project called Dignity Village, which is one of that city’s solutions to its homelessness crisis. A company called Hummingbird Micro Homes has been building tiny houses of 200 to 600 square feet in Terrace, in northern B.C. It has bought land that they can be parked on. Other cities have allowed them in settings that are like recreational-vehicle or trailer parks. Rockledge, Fla., became the first American city, in the spring of 2015, to amend its zoning to permit them in certain residential areas, according to a summary by University of B.C. landscape-architecture student Natradee Quek. Ms. Gambling and Ms. Koutalianos, the tiny-house advocates in Metro Vancouver, don’t know yet how quickly local cities might be willing to move on the idea. In Maple Ridge, Mayor Nicole Read said that, although planners have agreed to talk to the tiny-house representatives about the idea, there are many challenges. As well, she said cities typically try to maintain a required minimum square footage for housing units so that people are guaranteed a livable space. But, she said, she knows tiny houses are a popular idea. Vancouver is also interested but cautious. Councillor Andrea Reimer said she too sees the positives of having tiny houses. Editor’s Note: An earlier version of the photo caption on this story incorrectly said the square footage in the house was 320. This version has been corrected.